Meet “Lo” - The Creative - SABC News - Breaking news, special reports, world, business, sport coverage of all South African current events. Africa's news leader. SABC News chats to Mahlohonolo"Lo" Tshangela- about the growing creative industry. Creativity is ranked among the top ten essential skills for the forth industrial revolution. In 2015, creativity sat in the 10th spot, but has since moved to become the third most needed skill by 2020. This is according to the “Future of Jobs Report” by the World Economic Forum. 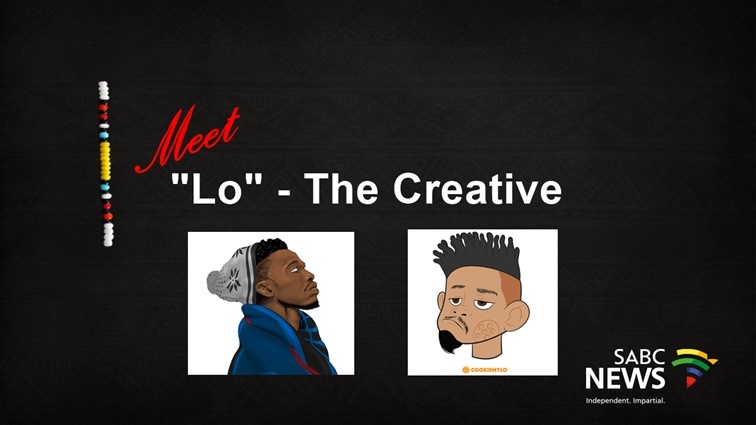 Mahlohonolo Tshangela, better known as “Lo” or “Cookie Mylo”, is a creative crafting his way in SA’s growing creative industry using illustration and animation. “Times are changing especially with the rise of digital media. We need to tell our stories, the world is hungry for our stories. The world comes and takes our stories to Hollywood when we are the minerals ,” says Tshangela. “Illustration actually helps communicate things that life images actually can’t,” he adds. Tshangela says his “strongest work” in the public space was for Soul City in a project aimed to highlight 16 Days of Activism against Women and Children abuse. “My relationship with them started with 16 Days of Activism against Women and Children abuse. It was almost as if figuring out what I needed to do with my talent – designing with a course,” he says. “I found it more fulfilling than anything I’ve ever created,” argues Tshangela. Watch Lo explaining how illustration breaks through race and age for one to communicate a message without specifically assigning a race to the character in the illustration. We meet with Lo just days before he plans to leave his 9 – 5 job to dedicate his efforts to Cookie Mylo Studio – an illustration focused studio he’s been building for the past three years. “I have spent a lot of sleepless nights working on my passion. Now my passion has gotten to a point where it’s almost putting the bread on the table,” explains Tshangela. He says contrary to popular belief, the creative industry pays if you work hard enough. This was not a decision made overnight, it was a rational one that’s been in the works for years,’ says Tshangela. The creative industry comes with its own challenges. According to Tshangela, this include long hours of grafting and, at times, having to wait for months before a project takes off. He says there are opportunities for one to work and succeed in the industry, but they are not enough. “You look at any bursary board, you’ll find that there’s hundreds of invitations for bursaries for engineering or the medical field – but what about the artist?” asks Tshangela. “ They [artists] also belong to society. They are responsible for so many things that people take for granted,” he says. He notes how artists are responsible for things as simple as road signs that are essential for society. Mainstream industry also tend to ask creatives, ranging from writers to artists, to do work in exchange for exposure. “I’ve developed a ‘No’ and you need to practice your “No” says Tshangela. Tshangela says he’s learned to say no to people who ask him to do work for free in exchange for exposure. “Sometimes it will shock people but that’s the whole point. That’s the only way that they will take you seriously, ”he emphasises. He notes how most people don’t understand the value in the work that most creatives do. “Some people say I draw ‘dipopai (cartoons)’ for a living,” says Tshangela. “I could already draw from an early age, so from an early age I knew that I wanted to be a designer,” he says. He remembers how he got the ‘stamp of approval’ from his mother who encouraged his to follow his dream after he showed her his work after getting paid for one of his projects while he was still studying. Though some people work as illustrators and animators without having gone through any formal education , Tshangela says it is still important to study. He later got bursary from the National Electronic Media Institute of South Africa (NEMISA ) where he studied animation for three years. Formal education, says Tshangela, exposed him to mentors and peers who’ve helped him to sharpen his craft. Living in a digital era with free digital tools including like YouTube and social media platforms, Tshangela encourages young creatives to use these platforms. “Use all these tools – they are free. They are absolutely free. As long as you have data to go onto your phone and look at other people’s stories, what’s stopping you from posting your stories and telling your stories about dipopai tsa hao (your cartoons),” says Tshangela. He beliefs he is not doing anything extraordinary, but telling everyday stories using illustration. “I just taking everyday stories and saying – ‘hey…don’t forget that…how about I sell it to you as dipopai [cartoons],” laughs Tshangela. This entry was posted on 12 Mar 2019,05:03PM at 5:03 PM and is filed under Lifestyle, Business, News, Homepage Featured Story Slider. You can follow any responses to this entry through the RSS 2.0 feed. Both comments and pings are currently closed.